AYP, Sears Craftsman, Husqvarna, Poulan 46 Lawn Mower Copperhead Mulching Blade Deck Rebuild Kit with Mounting Hardware. Please note that this is for a 2 blade 46″ Deck with 23″ blades that use a 5 point star pattern system (AYP). Not the 6 Point Star System (MTD). FITS: Sears Craftsman : YT3000 Husqvarna : YTH20K46, YTH2146XP, YTH2246, 2246LS, 2346XLS, YTH22V46M YTH21K46, YTH18K46, YTH2146 POULAN: 19546LT. Please match Replacement OEM Part #’s before ordering if you question if this would fit. QTY 2 – Replacement Spindles w/ Grease Zerks. Comes with Blade bolt, washer, grease zerk, mounting screws and top pulley nut. 187292, 192870, 532192870, 587820301, 587125401, 587819701, 587253301. 192870, 532187281, 532187292, 532192870, 539112057, 587253301, 587819701. QTY 2 – Replacement Copperhead Mulching Mower Blades. 403107, 405380, 40S380, 531309715, 532403107, 532405380, 917532403107, 917532405380, 917777405380. 532405380, 575937901, 777405380, PP21011. QTY 2 – Replacement Spindle Pulley’s. Husqvarna: 195945, 197473, 532195945. QTY 1 – Replacement Belt. AYP 405143 CRAFTSMAN 7133156 HUSQVARNA 532 40 51-43, 584453101 POULAN 575937701, PP21008. QTY 1 – Replacement Idler Pulley’s. AYP/ROPER/SEARS: 196106, 197379, 532196106. HUSQVARNA: 532 19 61-06. AYP/ROPER/SEARS: 177968, 193197, 532177968. HUSQVARNA: 532 17 79-68, 532 19 31-97. Please match OEM part #’s needed for proper fitment as some models have more than one spindle that fit them. 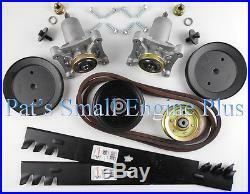 Our (PATS SMALL ENGINE PLUS) Part # DECKIT166. The item “46 Craftsman Husqvarna Poulan Mulching Blade Deck Rebuild Kit YT3000 YTH2246″ is in sale since Tuesday, February 20, 2018. This item is in the category “Home & Garden\Yard, Garden & Outdoor Living\Lawn Mowers\Lawn Mower Parts & Accessories”. The seller is “psepbiz” and is located in Isanti, Minnesota. This item can be shipped to United States.